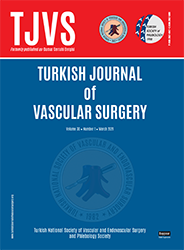 2Sakarya Üniversitesi Tıp Fakültesi, Kalp ve Araştırma Hastanesi, Kalp ve Damar Cerrahisi Kliniği, Sakarya, Türkiye DOI : 10.5606/tjvs.2017.6 Objectives: This study aims to compare short- and mid-term results of elective open surgery and endovascular aneurysm repair (EVAR) in the treatment of abdominal aortic aneurysms. Patients and methods: A total of 113 patients (117 males, 16 females; mean age 67.1±9.0 years; range 40 to 86 years) who underwent elective EVAR or open surgery with the diagnosis of an infrarenal abdominal aortic aneurysm (aneurysm diameter >5.5 cm) between January 2009 and June 2014 were retrospectively analyzed. Preoperative risk factors of the patients, short-term mortality rates, need for blood transfusion, duration of mechanical ventilation support, postoperative complications, and the length of intensive care unit and hospital stays were recorded. All patients were postoperatively evaluated in the outpatient setting and computed tomography was performed. The mortality and need for re-intervention rates were compared. Results: The mean follow-up was 29.6±20.0 months. Early mortality rate of the EVAR group was significantly lower (16.4% vs 2.6%; p<0.01). The need for blood transfusion, mechanical ventilation support, the length of intensive care unit and hospital stay were significantly lower in the EVAR group, compared to open surgery patients (p<0.01). Although the rate of postoperative complications was higher in the open surgery patients, there was no statistically significant difference compared to the EVAR group (p>0.05). During follow-up, there was no statistically significant difference in the need for re-intervention and late mortality rates and time of mortality between the groups (p>0.05).